Anthony Davidson has obviously accepted that it is unlikely his employer, the Super Aguri team, will race again in 2008. 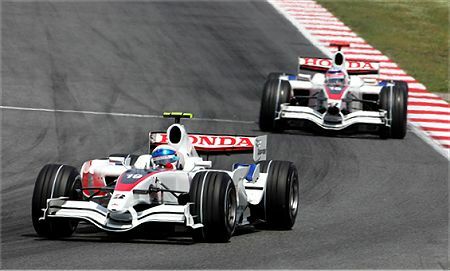 Reacting angrily to David Coulthard's description of Davidson and Takuma Sato as the "Stupid Aguris", he pointed out that the SA car is virtually undrivable, making the task of keeping out of the way of lapping cars almost impossible. It is rare for a driver to be so disparaging of the equipment he is given and this must surely indicate that Anthony knows it does not matter anymore. There comes a point where one has to face the fact that the dream has ended; Scott Speed reached it at the European GP last year and now it seems Davidson is there too. That means there will be one less team on the grid for the remaining races in 2008. Although SA's problems are financial and began when a major sponsor reneged on payment last year, the team is indirectly a casualty of the decision not to allow customer teams to compete in F1. It is that ruling that has made it impossible for SA to find a buyer, the cost of upgrading the team to constructor status being sufficient to put off interested parties. For the same reason, it is unlikely that Gerhard Berger will find an investor to share ownership of Scuderia Toro Rosso with him. The team is in a rather better position than SA, being still in possession of the old Minardi facilities, but development into full constructor status will be a costly process even so. That is why Dietrich Mateschitz wants to get rid of Red Bull's extra commitment, after all. So the F1 grid could be down to eighteen cars by 2010 - this in a climate where new races are being added to the calendar and the upper limit of twenty GPs per year is being strained as Bernie Ecclestone tries to juggle the old with the new. All it will take is for a couple of the manufacturer teams to withdraw (and Renault is constantly on the point of doing so) and the sport will begin to look a very poor show indeed. It seems obvious to me that the situation regarding customer cars needs more consideration. Compromise solutions have been suggested but not really looked at; the choice has always seemed all or nothing. Cost capping is regarded as a possible savior but will not begin to have an effect until the grid has been severely reduced. And the matter of costs is a relative thing anyway - it may seem a big improvement to existing teams to be spending $200 million in a year instead of $300 million but, to a team just setting up, both are likely to be out of reach. Super Aguri is almost certainly lost to F1, STR may well follow it into oblivion. There is little time left to give STR some hope of survival and I believe that the FIA should be working night and day to achieve a way forward on this. It is not only about the continued participation of small teams - it is also about providing a route for new teams to enter the sport. As things are, only the big manufacturers can think of competing in F1 and there are few enough of those about, most being involved already anyway. The agenda for any new FIA president must include this matter. The present incumbent was largely responsible for the recent Prodrive fiasco and for confused regulations that destroyed potential investors' faith in a practicable entry to the sport. The next must fix the problem very quickly or F1 will degenerate into a pointless affair forever dominated by one or two giants. The best solution would be to allow each team to sell their chassis to a single second team. Eg. you would have Red Bull -> STR, McLaren -> Prodrive, Honda -> SA, etc. Teams like Williams would have to just realize that without bigger (eg. factory-works) backing, they don't have much of a future in F1 without a customer car. They were the most vocal opponents of customer cars, the reason being that it would slingshot teams with lower budgets past them and place them further down the order (in turn, less revenue). It comes down to the sport requiring higher levels of capital investment each year. Efforts to cap money invested or expenditure are often in vain. This also helps in spreading out costs across more advertising and TV revenue, more testing and performance feedback and aggregating staff (eg. Williams and Toyota) to work on cars and engines together. Requiring that all teams to build a chassis is completely unrealistic, considering the upfront costs (wind-tunnel, simulators, people) and ongoing costs. There is so much money spent on over-lapping development, and marrying smaller customer teams to bigger teams would provide for both a deep and competitive field. Your suggestion is excellent, Nik, and is one of a few that could move F1 out of the trap it finds itself in. The problem remains that, before anything like this can be introduced, the FIA has to think of it! And that is why it is so important that any new president understand the problems confronting the sport and be intelligent and even-handed enough to listen to the various possibilities and then make a sensible decision in conjunction with his advisors. With the high cost of developing a F1 car today, I think the only way for F1 to continue to be at the forefront of technology and stop making rules to do otherwise is for teams to be able to sell their creations to at least one other team. That offsets the cost of chassis development and really will make F1 more competitive by eliminating the 'bad' chassis from under funded teams. Is SA a bad chassis? If it's last years Honda....yes! I think we do need to take into account Williams' argument, Aracer, that it is unfair that they have to spend all the money to develop and create their own chassis, while other teams can just buy one for much less and stand a good chance of beating them. Compromise must surely be possible, however. "Compromise must surely be possible, however. " What Williams are in effect saying is that their car isn't good enough, and won't be for some time.. as they will always be at a disadvantage. Agreed Clive, I guess my point is Williams can recoup much of the money spent by selling a chassis to a smaller team or simply purchasing one from a bigger team. Williams is saying because we spend a fortune do develop a car, everyone has to also. Is that best for the long term health of F1? The problem with Williams selling chassis is that they would struggle to do so, since they have less money to put into design and development than the big teams - so their product would be less appealing to new customer teams. The same goes for Force India, except more so. So Nik may be right that the only way to go is to allow customer teams, although that would almost certainly kill off small constructors. It is a difficult problem but not one that is beyond solution, I think. The idea of allowing new teams to enter with a customer chassis subject to the condition that they become constructors within a certain time limit may be the place to start. Clive I think by delaying chassis construction by a couple of years and plugging the gap with a customer car will only result in the same situation that STR find themselves in today. They run a customer car for a couple of years, and now struggle to find the investment necessary to build out the facilities required to build their own car. The rule change as you suggest would only do the same thing for every other new team. They would run customer cars for 2 years (still irking Williams), and then have to find $200-300M and a few hundred engineers and aerodynamicists after that. It will just be impossible to find 12 teams that can afford to build cars, esp since the teams running at the rear end of the field will not be attracting ad or tv revenue. Allowing customer cars means you only need 6 big budget teams, and 6 low budget teams running off of a chassis supply and engine supply deal. You could even see a team running a McLaren car and a Ferrari engine etc. etc. The trouble is that F1 is a constructor's championship and is one because otherwise you eventually find yourself with something approaching a spec series (remember CART was once a series with many constructors, but allowing customer cars eventually led to the 1/2 constructor situation that was there at the end). Allowing customer teams is near enough the same as allowing four-car teams, which is bad for racing competitiveness because it means there is less difference between cars and therefore less possibility of overtaking (whatever rules are put in place to make it possible). The Williams argument also partially holds because constructors would have one hand tied behind their back when competing with customers (they pay more to have the same car). These are the reasons why customer cars cannot be permitted, even if it does cost Super Aguri and ultimately Toro Rosso their places on the grid. At least Super Aguri were a team that did it because they had no choice, and I will concede they deserved a proper chance because of what they put into their team. Effort, happiness, chemistry and unpredictability - in a stabler environment, I suspect Super Aguri would have survived. Why Honda didn't support it properly when it should have known the cost before going in is a mystery. It doesn't help that Super Aguri apparently has debts of $100m, which is probably less than the cost of someone using the twelfth spot on the grid to set up a regulation-compliant team from scratch. Sad but true. If it is impossible to find 12 teams that can afford F1 without breaking the rules or diminishing the sport's capacity to be a sport rather than a procession, then F1 is too expensive. The readjustment will be painful, but then F1 should have known that when EJ, Tom Walkinshaw, Frank Williams, Ron Dennis and Paul Stoddart warned it so in October 2001. In the end, you have to look to FIA mismanagement and manufacturer largesse for the reasons why Super Aguri looks like having a sad ending. But I still hold out hope. There's been word of another possible buyer - I'm crossing my fingers that this one not only does it, but puts in the necessary investment. I don't think the ITV commentary showed the Super Aguri's once during the race. I certainly can't recall seeing them and could not tell you what livery they had on. Makes it hard to attract sponsors and backing when they are literally just phantoms on the field - you hear about them but never see them. I hate to suggest another rule - the sport is drowning under them as it is - but perhaps each team should be allocated a certain percentage of air time? That way at least the cars at the backend are visible to the viewers, and makes sponsorship worthwhile. Say if each team was featured just 5% during the coverage, then the remaining time could focus on the pivotal battles? That one would be pretty difficult to enforce, Peril, and would probably lead to all sorts of arguments. The latest rescue of SA looks a bit unlikely to me, Alianora - some are saying that the interested group doesn't have enough money to support a F1 team. All this does make Honda's intransigence over the winter regarding SA taking on Karthikeyan as a driver look overly picky. Since they're not prepared to support SA now, it seems unfair that they should have scotched one possible survival strategy by the team in the past. As I said before, this is a difficult problem but I refuse to believe that it cannot be solved by the teams and FIA sitting down together and hammering out some sort of plan for the future. To just allow teams to die without seeking a way to replace them means that the sport will die in the end. He pronounces open-wheel single-seat racing in the US to be a dead man walking. The rust on the fences at Indianapolis Motor Speedway lead me to agree. I think readers here know that the Indianapolis schism was caused by egos that did not get along, egos that did not find a win-win greater good for the sport. Is this the last chance for F1 to avoid a terrible decline? That having been said, if three-car teams are required, I recommend that the starting grid be limited to 20 cars (with all attempting to qualify) so that only certain teams will run three cars per race. Even if Super Aguri are saved, the fact is, they haven't done any testing and development on their chassis, so they're as good as dead last in every race. I think what Bill Sheets' blog demonstrates, Chunter, is that the wisdom to solve problems may be out there but is rarely used by those who have the power to make changes. Read any blog post that deals with the future of F1 and you will find intelligent and sensible comments that offer practical solutions to the problems confronting the sport. There was much debate on the subject of customer cars long before Prodrive gave up on the idea of entering F1 yet, during all that time, Mosley seemed to be sitting on his hands, just hoping that things would turn out okay. He was the one that had promised Dave Richards that customer cars would be allowed, he should have been forcing the teams to come up with a workable compromise. Bill Sheets reckons strong leadership is essential for the health of motor sport; he is right. You cannot give each team a certain percentage of airtime. Frankly I couldn't care less if I saw a SA on TV. To me as with so many of the problems in F1 the route cause is the technical regs. The reason teams NEED a huge budget is because the FIA has allowed aerodynamics in particular to get completely out of control. The top teams have always and will always spend whate the can generate. If McLaren found a way to generate $10 billion tomorrow they would spend it. The problem is that the rules have to be written in such a way that they only get a marginal advantage from spending that huge amount of extra money. All true, Steven, and the reason why F1 desperately needs a sound and competent president of the FIA. I like Steven's point, because I can compare and contrast it to the way they try to control costs in MLS (USA Soccer). MLS has a rigid salary cap, with certain players per teams allowed to be exempted with the thought process that a club's salary are paid by the league, not the teams, and if a team investor/operator (technically not an owner, but serving the function of an owner in the traditional sense) wants to carry some players that go outside this cap, he may put up that expense himself, but may only do so with a few players. Furthermore, one type of these exemptions may be traded during the annual talent draft as if they are players or pick positions, the other may not. Clubs that have strongly exercised their wallets with these exemptions have not been successful in the field of play, but I will not name them in order to spare the fans of the New York and Los Angeles teams some measure of embarrassment. F1 regs are trying to make it equally futile to spend a lot of money on a car, but it's fairly obvious that either the attitude or message itself does not grasp in motorsport. Perhaps this is because a person cannot have nearly the same impact as an inert part of a machine. I think from reading some of Alianora's statements as well is Sheets' blog, that maybe F1 needs an honest mission statement. Was the goal to prove who can make the best car on an annual basis? Nothing personal, but I think the answer to that has been Ferrari, and year after year, that same answer is drilled into our heads so much that it almost seems pointless to keep asking the question, and, if it really is a pointless question, what question should F1's championships answer instead? This is where a slogan-esque mission statement can at least point out some kind of future. Finally, in the past, the notion of shrinking motors and less wings and customer cars had me originally thinking, "Well, that's not such a bad evolution if the teams still take the competition seriously," but I've since realized we already have that in Formula 3. Do you think it is possible to create a worldwide F3 series, and promote Formula 3 until it is more popular than Formula 1? Just some odd thoughts for the moment. Part of the problem is that F1 has two mission statements, Chunter. The Drivers Championship means that it aims to find the "best" driver each year, the Constructors that it looks for the "best" car maker. The tension between these two aims sometimes results in the sport leaning too much one way or the other, although usually it is the construction side that produces the most obviously biased outcomes. There have been periods when you had to be in a certain type of car to have a realistic shot at the championship, whereas I cannot think of a year in which a driver in an inferior car has won everything in sight. If we try to settle on one aspect or the other, however, we end up with something that is not F1. It would be easy to have a Drivers Championship alone by designing a spec series - but we have that already in GP2. And a Constructors Series would swiftly develop into something like drag racing where all that matters is how much power you can apply to the road without exploding; an interesting exercise, maybe, but not F1. Your F3 idea is not only a good one, it's been done before, successfully. In 1961, it was realized that too few teams were entering for the 2.5 litre formula so Formula 2 was hastily instated as the new F1 formula. I see no reason why that should not happen again if F1 gets itself into a terrible mess or becomes too expensive even for the manufacturers. I was really struggling for time when I posted yesterday hence the brief post and horrific spelling mistake. There are a lot of simple rules which could be put in place very quickly that could address some of these issues. The need for a big budget not my spelling mistake. 1. Wings (if we must have them) can only be a single element with a limited complexity to the curve. No spoons etc as the leading edge and trailing edge must be flat. All parts of the end plate must be in the same vertical plane. Alternatively ban end plates and watch the downforce disappear but still have the wings to hold adverts. 2. The entire visible bodywork must be one single part made in the form of a single sheet of bonded material. Therefore not flicks, flip ups, chimneys, winglets etc. This stuff is not complicated. 3. All suspension elements must be round in section. These rules alone would slash 90% of the wind tunnel time needed to produce a car. 4. No electronic adjustments to the performance of he car may be made from the cockpit. So no need for multiple throttle maps, diff settings etc. That is the testing budget slashed. 5. The accelerator pedal must be connected to the engine throttles by a cable. No traction control. I have a number of other ideas but as can be seen from these it is the easiest thing in the world to write rules that dramatically reduce the amount of cash that NEEDS to be spent. The top teams will still spend every penny they can but they would be working on seriously diminishing returns. 6. No stupid aero devices pretending to be brake ducts on wheels. No-one on the planet believes they are for cooling. I concur very much with point 6, especially since I think part of the aero device falling off caused Heikki Kovalainen's accident on Sunday. The only reason I don't like Steven's recent list is that I know for a fact that every team in F1 will keep their tires heated in a (multi-thousand-euro costing) kiln or greenhouse after tire warming blankets are banned. At some point, F1 (teams, drivers, administration, everyone) must blame themselves for making their sport so ruthless. I think it's already proven that the teams will spend too much money regardless of how many regs are changed simply because they will want to study ways to exploit and circumvent them. What we really have is a game where one or two players (you know who they are) are so emphatically better at their game than everyone else in the proverbial schoolyard that most of the other kids are reaching a point where they don't even want to bother playing anymore. It is up to Ferrari and McLaren to want Formula 1 to be accessible to fresh competition, because like the schoolyard, if nobody else wants to play, the game will stop, and then it's back to the boring classroom again. But if McLaren and Ferrari don't try their best, then the game stops for them anyway. The nature of sport is to try your best, or else what's the point? And McLaren and Ferrari know that if they don't spend every penny they can find, they will cede the territory to people who can't spend quite so much, which to them is the same as not playing the game. F1 needs to re-attach itself onto the rest of the single-seater series. The customer car problem could easily be solved by making GP2 a split series in the same vein as British F3. The "International" class would be GP2 cars as they are now and the "World" class would be customer cars. When the customer teams have built up the capital to go to F1 as full constructors, then it will naturally happen. If the rules in F1 are relaxed so that there are multiple ways to be fast and none of them can be optimally covered with the budgets used in the series, then it will be possible to be competitive with the best for much less money, thus enabling more people to come up past "World Class GP2" into F1. Just a small point, but no one has mentioned it yet. Bernie is contractually obliged (through the deal that his Formula One Management company has with the FIA) to provide a grid of 20 cars at each World Championship Grand Prix. Bernie therefore has a significant vested interested in making sure that the grid does not drop below this number. And of course, it is a tragedy that a driver of Davidson's flair and raw speed may be lost to Formula 1, whilst someone like Ralf Schumacher (for example) had a long and prosperous (fiscally at least) career. It's over for Super Aguri :( I can't blame Aguri Suzuki for criticising Nick Fry - I think he's earned every word of it.